Attached below are scans of the front and the rear of the box. I've just got home with the game, so this newsletter is just going to give my initial impressions. Firstly, the intro. The game starts with white Japanese text scrolling up a black screen. This goes on for about a minute no music or anything. 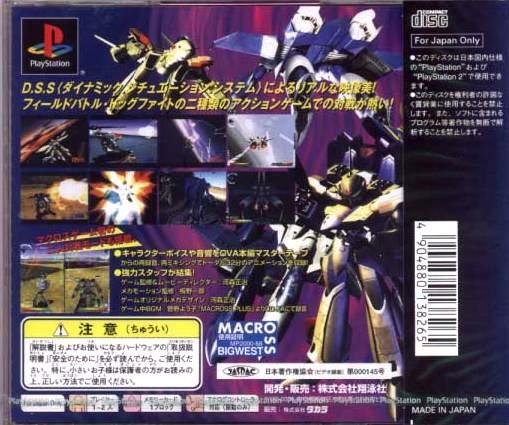 Then however, we get the FMV which basically starts with the scene from episode one of Macross Plus where Isamu Lucy bump into Guld Myung at Star Hill. This is then followed by bits of Sharon Apple's concert interspersed with various mecha combat scenes from the OVA. There is a choice of either 1 player play, called Story Mode, or 2 player VS play which can either be against the computer or another player (split screen play). Dog Fight: in which you can only fight in fighter mode. There is no Gerwalk mode that I have found yet. 6. After in the dark. After choosing the arena, you can then select your mecha. 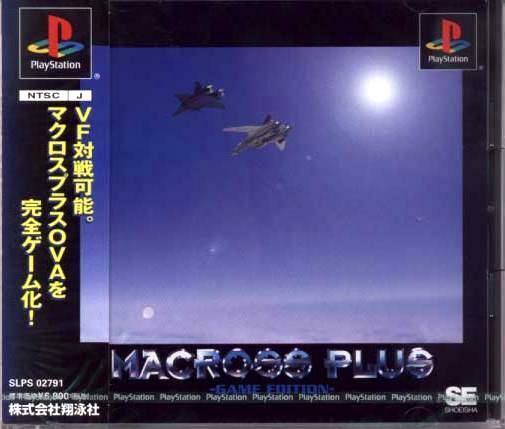 For Dog Fight Mode, only the Variable Fighters in Fighter mode can be selected. Unfortunately, the Ghost X-9 is not available at the beginning. This means you can only select the YF-19, YF-21, VF-5000, VF-11, or VF-1S. For Field battle Mode, you can select the above mentioned VF's in Battroid mode and also the Tomahawk, Phalanx, Defender, Monster, Zentradi Glaug, Regult, Queadluun-Rau, and Nousjadeul-Ger power armor. After choosing your mecha you then get the option to alter their color. 2 player Field Battle is pretty fun. Even though you can't transform, you can still use your verniers to boost quite high into the sky. Beware, though the Verniers can only be used for a short time before they run out and need to recharge. Also, the weapon load is quite limited and both the gun pod and missiles run out fairly quickly (unlike in VF-X2). However, your missile and gunpod ammo will slowly recharge themselves. The pinpoint barrier on the YF-19 & YF-21 has unlimited use, although you cannot attack when using it. Controls are pretty good and very responsive without being overly so. 2 Player Dog Fight Mode is not so good and suffers the same non-moving background problem as in VF-X2. Although the controls are quite responsive, the radar is a bit confusing being a 3D triangle which is supposed to point you toward your opponent. Now onto DSS, which stands for "Dynamic Situation System". When you are fighting, if you get close to your opponent, the letters DSS will flash on the screen. If you quickly press the 'X' button, your mecha will execute a special move, such as a kick in Battroid mode which you get to view. In the Dog Fight mode, there is a nice DSS move where your Valkyrie transforms from fighter to battroid and sprays the enemy with gunpod fire before transforming back to fighter mode. Basically, DSS is reminiscent of the old special attacks in the original VF-X game.